One of my colleagues ordered little something from ebay.com . She opted for free shipping and payed the amount via credit card. 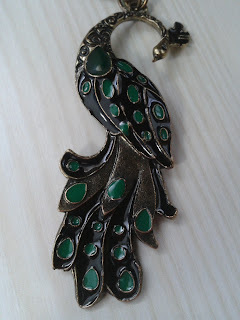 She placed her order 2 weeks back, which consisted of a peacock chain, an adjustable leaf ring, few studs. Her total order was worth 250 bucks( That's when rupee was at 50 per dollar ). She received one of her 3 couriers yesterday, it was packed well and shipped via hong kong air mail. I was little skeptical about placing any online order after my disappointing experience. Today as she showed me her chain, worth less than 125 bucks I regained some of lost trust. The packaging was proper and so was the delivery. I have seen the same chain retailing at 3 times the cost in some of the blog shops. Here is the image which was posted in ebay. Here is what she finally received, an exact ditto. Our experience with ebay has been much better than that of blogshops. 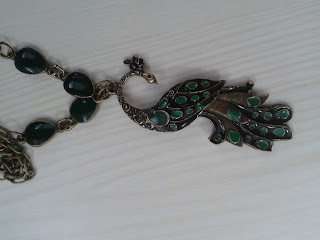 So, people who are really into fashion jewellery please stop by ebay.com. You may be able to find something you love at half the price as that of blog shops. A word of advice: Never order in bulk or for a large amount of cash. Always, but in small units . You may never know when your packet may go missing in transit. Ha-ha. I will follow that advice. The jewels look very nice. glad you found back your lost faith in online shopping!! Good luck next time you buy something!! @Uruj it's real pretty in real:). @Swarnali I would still caution people. Thanks girl:). I am compiling a list of shops I really lik and have good experience with. 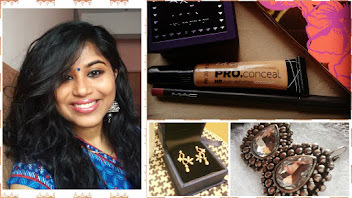 The blog is dedicated to my love for makeup, earrings, and fashion :). This blog is a medium for me to share my passion for makeup and display my vast collection of earrings acquired/gifted/collected/thrifted/stolen/handed down over the years. Also, I would be featuring latest trends, reviews, tutorials, shopping suggestions, hauls and store reviews.